0.1 What is a Hybrid Water Heater? 0.2 How Do Hybrid Water Heaters Work? 5 Do you want them this year or next? Have you ever been halfway through a shower and have the hot water run out and you’ve had to finish in cold water? Hot water is not available permanently in conventional hot water tanks. Conventional hot water tanks will run out of the water after 40 gallons. Do you have a large family, or just think you have a large energy bill and think there has got to be a way to lower it? Conventional hot water heaters account for 20% of most household’s energy bill. Hybrid Water Heaters provide a solution to both situations. Fairly new to the market and news, a lot of people don’t even know what they are, but they are becoming more popular as the people realize what energy savers they really are. 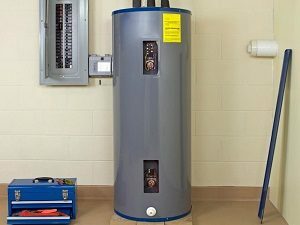 This article will talk about the best hybrid hot water heater, and its review and some things to consider when buying a water heater. Hybrid water heaters, sometimes referred or compared to heat pump water heaters, combines simultaneously the inner workings of both the electric water heaters and the conventional style. Over the past decade, the technology of the hybrid water heater has enhanced greatly; the combinations of heating water between a tank and tankless water heater are what makes a system a hybrid. Hybrid water heaters have come in electric, air, and water technologies. A heat pump or Hybrid water heaters both use different sources to pull heat from a variety of places instead of creating heat themselves. For example, the installed hybrid will pull heat from the hot summer air and use minimal electricity to generate and store hot water. The same goes for water, soil, and solar panels; the hybrid pulls the energy it needs to heat the water from these sources. Hence, hybrid water heaters have proven to be highly energy efficient for homeowners. Now we understand a little bit on how hybrid hot water heaters work, let’s take a look at other hot water heaters and how they operate. The traditional water heater relies on a storage tank that pumps cold water into heating coils at the bottom that heats the water up. The hot water rises and pipes which lead into the house then take and deliver the hot water. People who have gas delivered into their homes have a storage tank which heater must stay heated and on wasting gas during the day but to retain hot water when wanted. However, gas is usually a lot less expensive than electricity. The third way is people choose electricity to keep their water hot in a tankless water heater. As soon as a person turns the handle, water is sent through a heat exchanger that is charged by electricity and the hot water comes out of the faucet. The hot water is then turned off when the faucet is turned off. The downside to this method is waiting for the hot water to heat up. These three alternative methods have been the traditional means for heating water until the amazing hybrid water heater pump came along. Take a look at these three reviews and hopefully choose a design that is right for you. 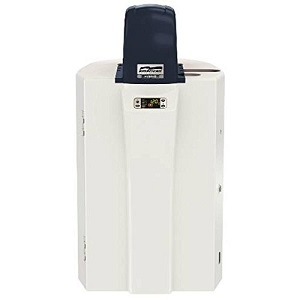 This water heater is designed by AO Smith and voted number one by all reviewers, the Voltex hybrid water heater has a new and creative design that cuts heating and energy costs up to 66%. Choice of Operating Modes: The owner can choose from Hybrid, Efficiency, Electric or Vacation to balance heating needs to environmental circumstances. 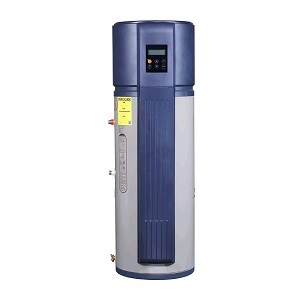 Electronic User Face: The Voltex Hybrid Heat Pump Water Heater also comes with an Electronic User Interface which is an easy to use temperature controller that also controls communicates diagnostics and operating modes. Protective Anode: This beautifully designed, best hybrid water heater, also has a protective anode that will protect this tank an extra ten years past what a conventional tank would. Two Extra Heating Units: Finally, this model has two extra heating features that aids the water heater recuperate faster in times of need. Drawbacks: Because it uses the surrounding air to heat the water and actually cools and dehumidifies the air in the process, this hybrid water heater is probably not best for small spaces or rooms. Replacing existing large water tanks would be perfect. This is one of the best reviewed hybrid water heaters. Everyone who owns one is completely happy with their product, and I would recommend it as a next home purchase. One thought to know that if a product like a hybrid heat pump water heater or any other product is made by EnergyStar then they are going to be quality built and highly designed with the environment in mind. As a U.S. Environmental Protection Agency voluntary program, EnergyStar creates products that are designed to help people save money and protect the environment with superior quality energy efficient products like the Senville 50 Gallon Hybrid Heat Pump Water Heater. Four Modes of Operation: The Efficiency/Economy, the Electric/Heater, the Auto/Hybrid, and the Vacation & Timer. Having control like this over one’s water temperature annually will decrease the energy bills substantially. Leak Detection and over: Load Protection, The built-in LED lit Control Panel which allows one to view the system’s status and adjust the gauges from a well-lit panel. 10 + gallons: reviews have boasted how the Senville Hybrid Heat Pump holds 10 more gallons than most other models making it the perfect hot water heater for larger households of 4+ bathrooms. Great value and investment: The Senville’s overall warranty is 6 years longer than most and the stainless-steel components hold a 5-year warranty. Also, because EnergyStar boosts on being affordable, the initial cost of this hybrid heat pump water heater is affordable. Drawbacks: Most people complain about the initial cost of hybrid heat pump water pumps, even though in the long run these costs will be offset by the reduction in the energy bills over the years. However, if one looks at the price of the Senville 50 Gallon Hybrid, he/she will be greatly surprised at how reasonable it is. If you want an affordable hybrid hot water heater, I would seriously consider the Senville Hybrid Water Heater. It’s backed by EnergyStar, one of the most reputable names in the business. 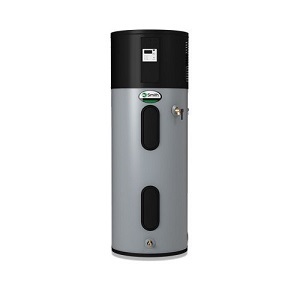 If one’s home happens to be equipped with a propane gas line to already reduce electric costs, then homeowners will be amazed at what this latest hybrid heat pump water heater can do. Instead of having electricity pump the water, this smaller tankless model passes the heat to the water in a storage tank. Water within the tank then gets more heat from the gas inside the flue. These models are easy to install and operate like tankless heaters. However, it’s the technology behind the hybrid of the American hybrid GH-90N model which produces phenomenal news to the water heating industry; it merges the finest qualities from the typical tank-type water heaters and on-call technology. Merges two technologies: One of the benefits and features of having the (AWHC) Hybrid Natural Gas Residential Water Heater is that it merges the greatest qualities of the traditional and tankless technologies. It will provide 90% thermal proficiency. Electrical LED pane: This (AWHC) Hybrid Natural Gas Residential Water Heater allows you to adjust the temperature and to check the system for error codes and fault indicators etc. Modes of Operation: it also has modes of operation including a Boost Mode which tells the machine to heat more water. It also has an Energy Saver and Vacation Mode. Safety Feature: Even more impressive are the safety features that dictate the unit turn itself off when certain circumstances arise. Drawbacks: If an extended warranty is offered, take it. Customers have been very satisfied, but American Water Heaters have pleasantly told customers to watch their warranties too. Seemingly only one-year warranties. With this wonderful technology available, if one has a gas house, this perfect sized hybrid hot water heater is definitely the one I would buy. Before making this kind of investment on one of the best hybrid water heaters, there are some things homeowners need to take into consideration. How many family members are there in the family? A typical person can use up to 30 gallons of hot water a day. First Hour Rating (FHR): Turn on all the appliances in the house at the same time and see how well the unit runs; this will help the homeowner determine how well the unit would run during busy times of the day. Gallons Per Minute (GPM): Empty the tank Now measure how many gallons the tank will hold in a minute. Less water=higher temperature. A traditionally sized water heater used to be 40 gallons; most families today need much more than that. Fortunately, hybrid units do not require much room, but what is needed is enough space for a serviceman to come in. Due to Federal Regulations in 2015, all water heaters sizes were increased in width and height. Therefore, any new unit will be bigger than the model you already have. Remember the benefits of having a hybrid water heater is the fresh cooler air it will be emitting, so it needs a larger space. This will depend individually and per house owner, but according to energy saver with energy gov. the average hybrid water heater has paid for itself within 4 years proving their worth. Several benefits exist in owning a hybrid water heater and all the hybrid water heater reviews agree that these appliances are energy efficient both to the homeowner’s wallet and to the environment; they have different operating modes, and they are the safest model on the market. Durability: When one finally decides on the best hybrid water pump or heater for there new or established home, chances are they have gone to the electricity gov. page and seen the formula that will show them how much money they will save by putting this addition in their home. Not only will most families reclaim the cost of one of the best hybrid water heaters within 4 years. Energy Star has estimated certain hybrids will save larger homeowners over $300 a year when compared with a standard water heater. That same comparison showed a payback period in 1.6 years with savings of its lifespan of $5,500. The hybrid water heaters lifespan which is typically 10 years +. Cost-Effective: It’s easier than ever to pay back the initial investment of one of the best hybrid water heat pumps/hybrid water heaters with the new Federal Tax Credit incentives. Since 2016, homeowners who purchase new water heaters, especially green ones, receive money back on their tax returns qualifying for both federal and state tax rebates. With this incentive in place, the hybrid water heater will be paid back faster than ever. Another way the hybrid water heaters are cost-effective is that their connections are identical to those of most traditional water heaters, so if the homeowner is planning on placing the hybrid in the same place installation will be simple and inexpensive. Multi-Tasking: Homeowners will never run out of hot water again is a critical key point for buying a hybrid hot water heater. Women of the family will all unanimously agree if not the men too, that never having to take cold water showers again are worth every penny. Many of them hold 2-3x the water of traditional models and the operating modes ensure that cold showers will never occur again. It also means one won’t lose water or heat if two appliances are running at the same time. Which means the teenage daughter can take her shower while the dishwasher is running, the laundry is being done, and dad is in the downstairs shower; the water pressure and heat will be there. Control Room Temperature: Depending on where you live can be a pro or an easily fixed con to your hybrid water heater. Since these are designed to take the warmer air and use it to heat the water in the water heater, the homeowner who lives in warmer clients will benefit in cost savings more than one who lives in cooler ones. However, for those homeowners who are living in those cooler zones, placing these hybrid water heaters where one has normally found them, next to furnaces, next to washer and dryers, studies have shown that the water heaters are taking the heat dispersed from the dryers and heaters can be used as well. Specialists also recommend other tools like a ground tool which will take heat from the ground and ways to store the heat, for those in colder climates, so they never have to worry either. If a homeowner goes solar with any of these hybrid water heat pumps heat is never an issue. Wherever the homeowner chooses to place the hybrid water heater, whether it be a laundry room, basement, garage, etc. a wonderful reminder is that space will be completely dehumidified. The system puts of clean, cool, dehumidified air. Think about the benefits of one’s laundry or garage space. Greener World: Many homeowners don’t realize that the hot water heater accounts for almost 20% of one’s energy usage; when one can cut this number, the homeowner saves money, but the environment is helped as well. Most of the hybrid water pumps have almost no greenhouse gas emissions; therefore, they are one of the environmental friendly appliances on the planet. For example, if electric hybrid water heaters were placed in every American home, we could get rid of close to 30 coal-fired power plants or half of all cars. That is how much pollution would be gotten rid of just by switching out water heaters. Furthermore, by using a hybrid water heater, a homeowner is cutting his/her carbon footprint annually by 2 metric tons; this is around 10% of the United States populace’s average footprint. Hybrid/Automatic: This is the machines default and primary setting used daily, it provides the hot water that is needed and saves money for the homeowner. Heat Pump Mode/ Efficiency: By utilizing the heat pump solely, the homeowner is lowering costs and maximizing energy efficiency. High Demand/Boost: If the homeowner is planning on guests or one is having a particularly heavy day, this operating mode uses back up functions quicker to receive water at an accelerated rate to ensure everyone has plenty of hot water. Standard/Electric: Utilizes just the electrical units to heat water, which is the quickest way but least efficient. Vacation Mode: Also known as sleep mode, the homeowner can switch the hybrid water heater into this mode when the family is gone from the house, so they are saving money. Safety: If a homeowner chooses to go with one of the best electric hybrid water heaters, they ensure safety because they lower the potential for toxic gas combustion and exhaust. Also, because of the many operating modes, even though one will never run out of hot water, one can rest assured that boiling hot water will never come spewing out of one’s faucet. One still has the abilities to set the temperature gauge of the water and cool water will come from the faucet as it is being warmed by the coils in the system whether gas or electric. All of these hybrid water heaters are equipped with a single high-efficiency burner. This burner has power-vents and/or combustion burners which are sealed. This helps stop spills and overloads. With all the many costs, home, environment, and general life benefits to be gained from owning a hybrid water heater, it comes down to choosing the best hybrid water heater for one’s home. Conventional or traditional water heaters are just not enough to service the average homeowner’s home. Most conventional tanks only hold 40 gallons, and when that water is gone, it is gone until the tank has time to fill up and heat again. This equates to cold showers, dirty dishes, and waiting to shave. This doesn’t ever have to happen again. Now, with owning one of the best hybrid water heaters, you can save yourself from family arguments, while saving monthly energy costs and the environment. While you may not be prepared right at the moment, now is the time to start thinking about it, especially with such great tax benefits. Do you want them this year or next? Now is the time to start thinking about what is best for your family. We have listed the 3 best hybrid water heaters available and researched them for you. We have researched much hybrid water heater to find out the best for you and these 3 won. So, now you can read all three reviews here why and find the best one for you. Whether you have an all-electric house or a partially gas and partially electric home, we have given you the best hybrid water heater choice for your home. The research has been done for you, all you have to do is make sure the installation is done properly. If you need help picking the best water heater for your home, please feel free to contact us and we will get back to you soon! I am looking to replace my existing 14+ year old 40 gal water heater which is located in my attic. I think I want a electric hybrid water heater w/ a Heat pump for two reasons. 1. they are energy efficient w/ the heat pump. 2. The by-product air from the heat pump will cool down the attic and dehumidify my attic. I live in south Texas, so it is very hot and humid 6-9 months/year. b. modes of operation: Heat Pump Mode/ Efficiency, High Demand/Boost, vacation.